A fossil cave and associated sediments and fossil fauna located on the Greek island of Rhodes in the eastern Aegean Sea is reported here, and the depositional history discussed. The sediments were deposited during the late Pliocene, in the interstitial space between basement boulders of up to 1500 tons. The depositional history of the cave comprises eight stages. From initial flooding, the basin experienced a continuous transgression with sea‐level rise in excess of 500 m, followed by a rapid, forced regression of similar magnitude. The recognition of a succession of fossil communities illustrates this transgression, with a seemingly abrupt shift from endolithic to epilithic biota dominance late in the transgressive cycle. The communities recording the increasing water depth from 0 to >150 m are: The Gatrochaenolithes torpedo (bivalve boring) and Entobia gonioides (sponge boring) ichnocoenosis, with peak distribution between 0 and 1 m water depth; the E. gonioides – E. magna ichnocoenosis, with 1–5 m depth peak distribution; the exclusive E. magna ichnocoenosis, with 5–40 m depth peak distribution; and the E. gigantea ichnocoenosis, with a peak distribution approaching 150–200 m. Below this depth, an epilithic community without boring organisms takes over, characterized by the calcareous sponge Merlia cf. normani, and the inarticulate brachiopod Novocrania turbinata. 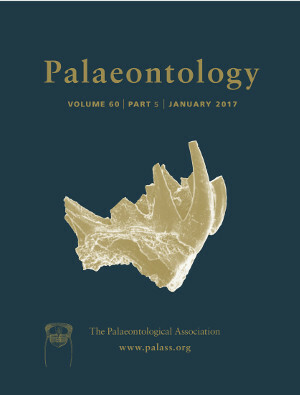 Simultaneously with the succession of the endo‐ and epilithic cave wall fossil communities, skeletal calcarenite accumulated on the cave floor; the erosional remnants of this sediment are insufficient to further expand the overall transgression–regression model.